This top control dishwasher comes with breakthrough Ultra-Fine Filtration. It continuously cleans the wash water for superior performance, even with the heaviest loads. Its Advanced PRODRY option delivers the best drying performance by circulating the air from a heating element. Combines a bold blend of professionally-inspired styling with sleek touches for the home, like Satin Textured Handles. Extends the Advanced PRODRY cycle time for excellent drying performance. The #1 rated dishwasher according to a leading consumer magazine, this Top Control Dishwasher just revolutionized dish cleaning. This innovative KitchenAid Architect Series II dishwasher with Ultra-Fine Filter removes food particles from the wash water throughout the cycle to ensure shorter cycles, using less water and less energy even with the heaviest of loads. Plus, there's no need to ever remove and clean the filter, and features like ProScrub and ProWash virtually remove the guesswork from getting a variety of dishes clean. Does anyone experience a buzzing noise? I just had this dishwasher installed yesterday. Yes, it is much quieter than my 12 year-old GE. But has anyone noticed a &quot;buzzing&quot; noise during the wash and/or rinse cycles? I just need to know whether or not this is normal. Thank you for your answers. 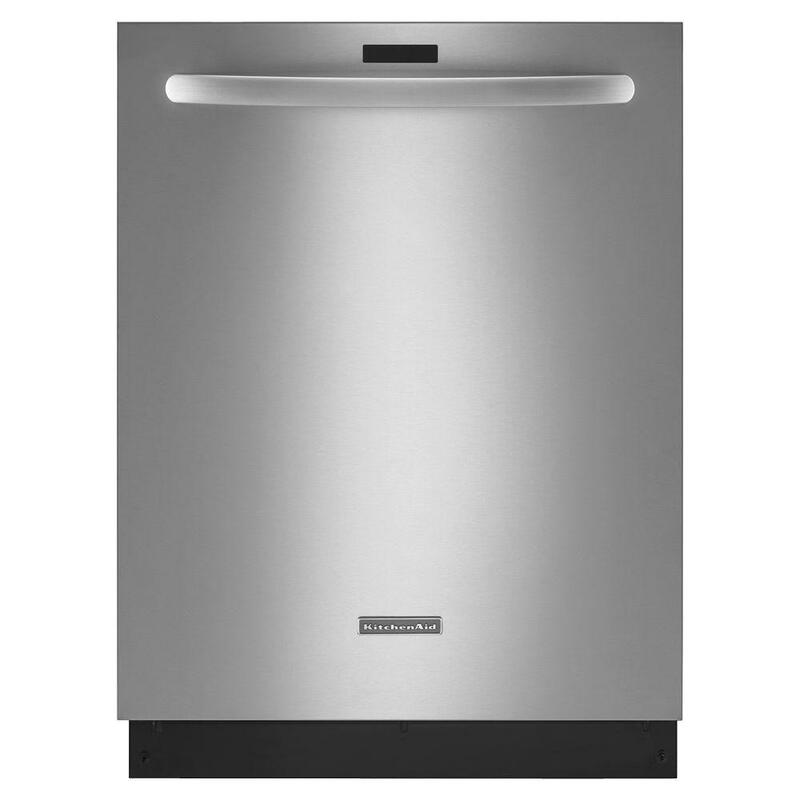 Is installation for the KitchenAid dishwasher available, and if so, what is the cost? Installation quote was $600 on 08/01/18 in Massachusetts. Seems too high. I have cabinets on either side of the dishwasher. Are they likely to get covered in moisture from the steam exhaust created by the ProDry option? Mine was fine for a year and a half. Then something changed. My cabinets to the left (right by the upper left door vent) are trashed. Unfortunately I didn't notice it until the damage was done. Luckily they are solid cherry so they won't just fall into dust. But yeah, major water damage has occured. Plus now that I'm coming up on 3 years, the thing stinks like crazy. 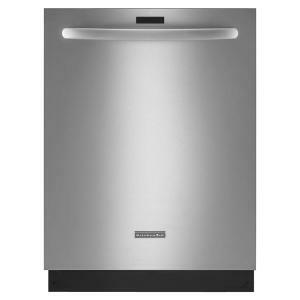 Top Control Tall Tub Dishwasher in Stainless Steel with Stainless Steel Tub, 43 dBA is rated 4.6 out of 5 by 3660. Rated 5 out of 5 by WB from So far,so good.... We were hesitant to spend $900 for a dishwasher (on sale), but in the Consumer Reports ratings and in the other on-line reviews, this one consistently got top marks. Initially, we were going to purchase a Bosch, but learned that none of their models have a heating element for drying, and that dishes came out wet was a consistent complaint in reviews. We extensively reviewed KitchenAid and Kenmore, and through trial and error by loading plates and wine glasses into store display models, determined that a third rack was more of a nuisance than necessity. While our initial budget was in the $600-$700 range, at the end of our process, we decided to spend the additional money for what was being touted in impartial reviews as the best. At this point, we have only had it a month, and it has met our expectations for $900 dishwasher of cleaning and drying thoroughly, being simple to operate, and being very quiet. We would expect nothing less, and have not been disappointed. Rated 2 out of 5 by Xyriut from Moved into a new home, replaced all appliances. This washer replaced a low end GE model that, whi... Moved into a new home, replaced all appliances. This washer replaced a low end GE model that, while performing very well, did not fit the new decor. Unfortunately, this unit KDTM354DSS, washes like someone simply dribbling across our dishes. It never removes anything that even remotely had a chance to dry on the dishes, like guacamole, and sometimes even ketchup. However, it does a great job on glasses that simply contained soft drinks, wine/liquor. Not sure that's really an accomplishment though. Last week, the PLASTIC bracket which holds the top shelf to the sliding arms broke. It was literally held on by a tiny plastic tab. So, the top shelf hangs down on one side, and sometimes falls into the unit. I would STRONGLY suggest staying away from this model, if not Kitchenaid altogether, if they literally hold critical pieces together by tiny plastic tabs instead of metal, and the performance in general has been abysmal. Rated 1 out of 5 by disappointedconsumer from Originally, I gave this dishwasher a great review when I bought it in 2014 because it was very qu... Originally, I gave this dishwasher a great review when I bought it in 2014 because it was very quiet and it still is as well as it still does a pretty good job cleaning the dishes. That's about as good as it gets though. One would think that for a fairly expensive dishwasher that it's last more that 2 1/2 years but the motor gave out three months ago for a $500 repair. I didn't buy an extended warranty originally as I thought I was already paying for a better product - was I wrong. Further, most of the the dish racks and related parts need to be replaced. Trying to get replacements is a nightmare - I've been waiting for months. Then they try to tell you that the rack components/parts aren't warranted - only the racks are. Well as a consumer, I bought the racks as a whole, not in separate parts - infuriating. I found out that Kitchenaid products are now made by Whirlpool - what a shame as Kitchenaid USED to stand for real quality. We've had terrible experiences with other Whirlpool products - avoid them like the plague. Rated 1 out of 5 by Pagoda from I would strongly recommend to stay away from any Kitchenaid or Maytag. They have a side vent, tha... I would strongly recommend to stay away from any Kitchenaid or Maytag. They have a side vent, that creates moisture on the door. I called 12/28/18 to discuss and was told by Kitchenaid it was my problem since I did not research their product. I have a farmhouse sink, which the vent is next to. The condensation creates drops of water from the vent that fall onto the top of my cabinet door. As a consumer, I was told it is my fault... There is nothing in the installation or owners manual. Kitchenaid said they would send someone out. If the dishwasher was working, I would have to pay the bill. It is working and it has ruined 1 door so far. Depending on your setup, their product could create water issues. Stay Away! Rated 1 out of 5 by fixitinstallerguy from I just bought this dishwasher and I am installing it now. Time will tell if it is a good dishwash... I just bought this dishwasher and I am installing it now. Time will tell if it is a good dishwasher. But I am now writing about the installation and the insulation surrounding the dishwasher. Installation has been a pain so far. Primarily because the thing has insulation loosely draped around it. I really mean loosely. it is not really attached to the dishwasher at all. Hence when you try to push the dishwasher into the cabinet it slides all over, bunches up and just causes trouble. It is like shoving a gigantic cotton ball into a pin hole. Why can't the idiots who design these things think a little about how the stupid thing will fit into the cabinet. The insulation needs to fit tightly around the appliance so it can be pushed into the cabinet along with the dishwasher. As it is I may just have to remove the insulation so it can be pushed into the cabinet. Really stupid design. Rated 2 out of 5 by BrokenDishwasher from The dishwasher cleans well when it works, but I've had two major repairs on it in the two years I... The dishwasher cleans well when it works, but I've had two major repairs on it in the two years I've owned it so far. One of the sliders on the top rack broke off, and it appeared that the whole thing hinges on a few flimsy plastic pieces. After that was fixed, I noticed that the dishwasher would fill with water but not wash. That turned out to be a control board failure. Thank goodness for the Home Depot protection plans, but they're super slow to get repairs done. They schedule three weeks out to have someone come and verify that it's broken, then three weeks again to actually repair it, meaning 6 weeks without a working dishwasher. In short, I can't recommend either this dishwasher or the protection plan. Rated 1 out of 5 by DissatisfiedCustomer from Home Installation was WORST I've ever encountered I don't know about the dishwasher itself and I would gladly submit a review for the installation component itself except there is no provision for this. Be very careful before you select home installation. Our installers showed up a day late. They didn't call to give us any heads up but just showed up at the end of their day shaking their heads saying they couldn't install it even before they laid eyes on the dishwasher! They first said they couldn't put it under a countertop (seems baldly false) and then, when pressed, said there was a leak. We had been waiting without a working dishwasher for two weeks and when I challenged their assertion that there was a leak the installer simply said "do you want me to leave it here or not? I am not installing it". You can readily get the same dishwasher from a store that rhymes with Rose (hint, starts with an 'L') for precisely the same price. I have now cancelled my order with Home Depot and I will be buying it and all other appliances from said alternate company.